Although the technology has been around for a very long time, not many people know about the seemingly magical application of Wake on LAN technology that is present in most modern computers, laptops and network appliances. By using the ‘Magic Packet’ over the network, you can avoid the hassle of having to be physically present when it comes time to power on a PC, server or laptop. If you have configured your LAN and WAN correctly, you can even send a Wake on LAN request across your entire network, allowing you to power on a computer that has been accidentally shut down, or left off after a power failure has occurred. Having the correct software configured for your environment is not only convenient, but it can also be a real cost saver. Why travel great distances to remote sites, or pay somebody to travel on your behalf, when you can power on a machine with a simple command or a mere mouse click. We will take a look at some of the best examples of Wake on LAN applications that are available at present, and help you decide which one is the best fir for you and your network. 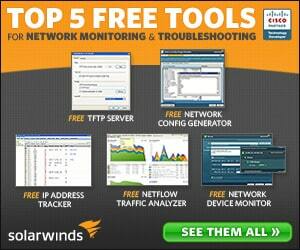 SolarWinds brings you a straight forward, easy to use Wake-On-LAN application that does exactly what you need it to do. It comes as part of their Engineer’s Toolset, which is a suite of applications that most system admins and technicians swear by as a useful and convenient source of tools for their operating environments and networks. Even power users that find that their desktop PC needs to be powered up after hours can achieve this via this tool, provided that the target PC has Wake on LAN activated in the computer’s BIOS, and that the necessary firewall ports have been opened on the router. To use the application you will need the target PC’s mac address (also known as a hardware address), and in some cases, the IP address as well. Once this information has been entered in, the ‘Wake Up PC’ button can be pressed and the target PC will awaken from its power saving slumber. This is a very basic program and it'll help you wake up any PC's or Servers on your Network – And most Importantly, its 100% FREE! Depicus WOL GUI is another Wake on LAN tool that uses a Graphical User Interface to send commands to the computers on your network. Prior to the mainstream adoption of Wake on LAN, the commands were previously sent via the command line, and some programs still use this method of execution to run their applications. It has a few handy features such as Subnet Mask options, as well as the ability to customize the Send Options and port number that you wish to use as the ‘Magic Packet’ port for your Wake On LAN command to work. 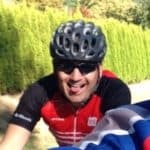 This is a free tool that will allow you to save yourself a trip to the office on the weekend to switch on your computer or a server, but not much else. When you are looking for a Wake on LAN tool, simplicity is often the key to success, and the Depicus WOL GUI app is no exception. Nirsoft’s approach is a slightly more complicated one, and it has some great ideas about how to implement Wake On LAN onto a network, especially if you are not too familiar with the configuration of the systems before you. The program allows you to send a Wake On LAN request to your target machine, waking it up and bringing it online. The application also has a built in network scanner which allows you to record the details of the computers on the network for later use. Once you have saved your list, you can return to the application later and execute the Wake On LAN command to the PCs that you have stored onto your list, provided that they are configured to respond to your ‘Magic Packet’ request. 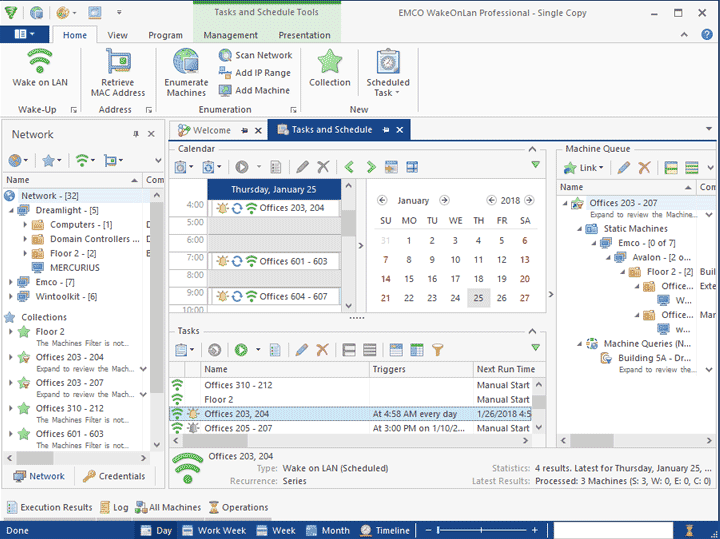 There is also a scheduler built into the application, so if you have a computer that needs to be on at a certain time of the day, or at night, it can be run routinely and automatically. 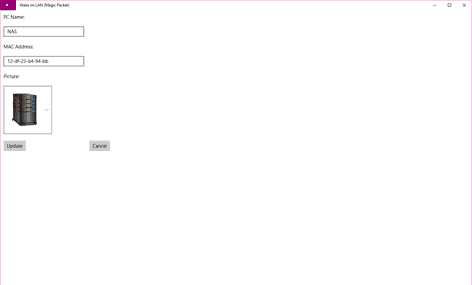 The app can be executed via the command line as well, so it can be added to batch files and scripts if you like. Aquilatech WOL is another multipurpose application that does more than simply act as a Wake On LAN tool for your network. It also includes a ping tool, a remote shutdown function, and it is all wrapped up in a single GUI design to make it as easy as possible to navigate and use. 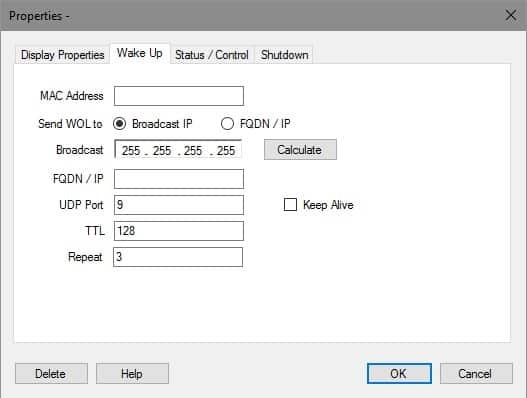 The WOL functionality is also quite comprehensive, and it gives users the option send the Wake On LAN requests via Mac Address, Broadcast IP, or a Fully Qualified Domain Name/IP address. The computers on your network can be discovered and added to the application’s list, where they can be interacted with quickly and easily through the GUI. A simple tab system allows users to select the option that they are after, such as Wake UP, Shutdown, and Status / Control. A great feature is a Listener module, which lets you inspect incoming WOL requests. 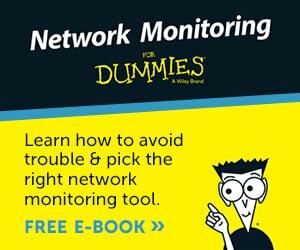 This is incredibly helpful if you cannot get WOL working on your network and need to troubleshoot. For those who are not afraid of a little command line action, MC-WOL from MatCode fits the bill quite nicely. It has plenty of command line switches, meaning that you can fire away your Wake On LAN requests a quickly as you can type them. The is of course, nothing preventing you from writing some scripts with this lightweight and purpose build tool, which will allow you to automate and schedule certain WOL tasks if the need arises. A full list of commands are available on the website, and understanding the syntax is very easy. 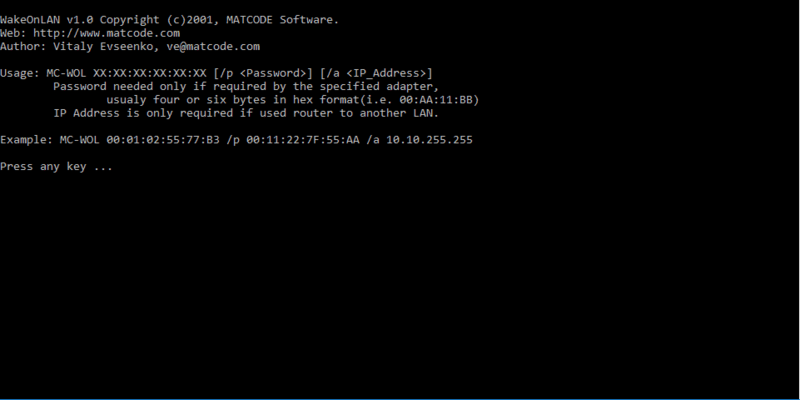 MatCode has other useful applications as well, such as the Remote Shutdown tool, so if you are looking for separate apps to perform these functions for you on your network then be sure to check them out. 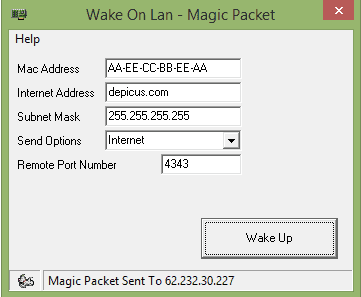 WakeUp 1.01 is the simplest application in our list of Wake On LAN tools, and it literally does only one thing: WOL. This is a good and bad thing, depending on your requirements. If you need a free to use, command line driven WOL tool that is extremely lightweight and simple on a LAN, then this app will work well for you. Sadly, its age has started to show, so you may wish to try some of the other programs that we have had a look at thus far. The lack of options means that you won’t be able to use the WOL commands over the internet, or across IP ranges, which may limit its usefulness depending on your environment. On the other end of the spectrum, we have Wake on LAN from HM Software NL, which is one of the most modern styles of WOL application in our list. Not only does this application work with PCs, servers and laptops, but with tablets as well. The application is very similar to some of the other examples that we have taken a look at so far, but with a more touch screen friendly layout that is more reminiscent of a smart device app. The differences between the free version and paid for version may make the purchase worthwhile for your particular environment. The free version caps off the limit of PCs that you can have configured at 5, and task execution is capped at just 2 operations. These options are unlimited in the paid for version. $249 single license (1 PC), $595 unlimited licences (unlimited PCs), and a free version is available as well. Gammadyne has created an easy to use WOL utility that runs directly from the command line. Simply run the command from the command prompt without specifying the mac address and you will see all of the commands and options displayed for you to see how to formulate your query. There is not a whole lot of additional functionality for you to look at, but there are some good additional features such as password specifying, for certain WOL NICs, and specific port selections if you need to tweak your WOL command on the network. This is a competent WOL application that will do what you need it to do from the command line, so if you need something that will work well within your scripts and batch files, then this is a good option for you to consider. A suitable Wake-On-Lan solution can add extra value to your network, and will enable remote support functions to be carried out with greater efficiency and speed than what can be achieved by sending a person to physically power on a device. 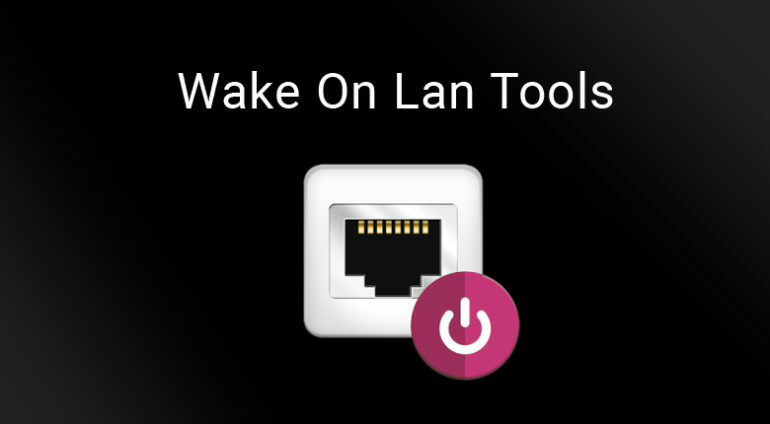 There are many reasons to want Wake On LAN on your network, so hopefully the completed list that we have put together will help you to decide which application will work best for you. 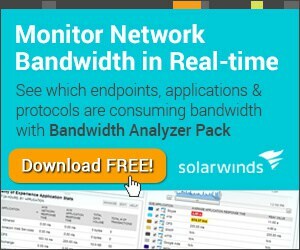 If you are looking for a simple Wake On LAN application that doesn’t have too many features, but is still powered by a Graphical User Interface, then SolarWinds WOL is a good starting point. It gives you the core functionality that you would expect from a WOL app, without any of the unnecessary features that some programs ship with that detract from the overall functionality of the product. 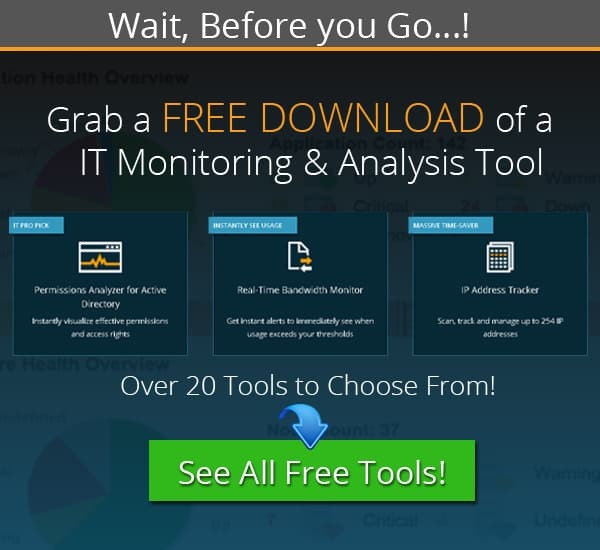 There are so many good free tools out there with you to experiment with, and this list is a good starting point for anybody that has always wanted to experiment with a WOL solution. We hope that you have found this informative and useful, and that you will be able to remotely power up your systems when the need arises in the future!